Right now, as we gear up for a fantastic match-up between Mendes and McGregor, José Aldo is in Brazil being sacrificed at the altar to make way for an era that may never come. Many of the new fans brought to the sport by a year of hype and PR could be forgiven for believing that Aldo is nothing more than a scared has-been who should just fade away and make room for the new guard. Since then Aldo has been accused—on Sportscenter, by Dana White—of having a history of ducking fights. The UFC released a statement concerning the injury, declaring it a bruise and not a break. Aldo was cleared to fight, Dana said on OTR, and other fighters “many fighters” have fought with similar injuries. dot dot dot. Yet the “Aldo is ducking, and actually this is something he’s done before” spin on the situation continued. 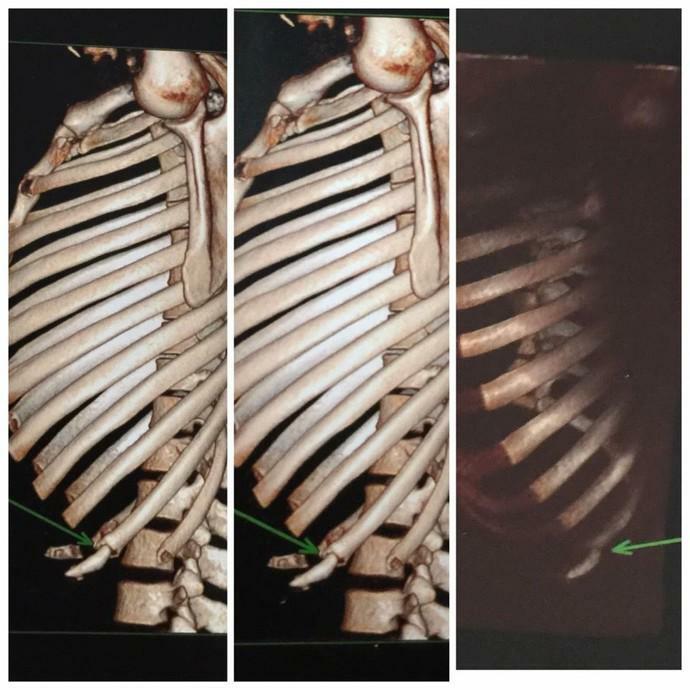 Eventually his camp released a 3D scan of his ribcage to prove that he had indeed fractured his rib. Dana White and Conor McGregor still speak of the injury as if it were a bruise, and not a break. McGregor using the injury as fuel for his personal PR campaign is understandable. Dana White not stepping up and defending the champ is less so. Unless of course you start counting all of the money everyone has lost because Aldo couldn’t stay healthy for the fight. That big loss, which will most likely be recouped over the next few events as the McGregor-Mendes-Aldo-Edgar quartet resolves itself, is not enough to justify UFC management downplaying the injury and allowing the “ducking” narrative to continue unchecked. Another thing to consider is the very existence of an interim belt to begin with. There really is no reason to grant Mendes or McGregor a title of any kind. José Aldo fought eight months ago. He has defended his belt as often as any champion in the UFC since 2011, with only Jon Jones fighting more battles (go check it out, even with the five pullouts). There is only one reason to do so: feed the hype-train created over the last 14 months by acquiescing to McGregor’s demands. Money is at the heart of this decision and perhaps also a strong belief in McGregor’s ability to do exactly what he claims he can do. There’s merit in that gamble. And honestly the UFC was put in a very difficult position by Aldo’s training methods: what else were they to do? But the issue isn’t just the interim belt—or the possibility that a unification bout would be fought in Dublin—it’s the way Aldo has been pushed aside as if he really were a coward, as if he had already been defeated. As if everything the PR campaign has been telling us had actually come true. It hasn’t. Not yet anyway. This isn’t the first time a big name fighter has been thrown under the bus for underperforming, speaking out of line, or otherwise crossing management. GSP comes to mind. Although one could step back and perhaps see a plausible reason for a promotion turning its back on a champion—uncontrollable drug use perhaps—it still leaves a bitter taste in your mouth to see a dominant champion, who also comes off as a gentleman, being ditched for a brash personality who has made his case as much with insults as with his sublime striking.